Josh Donaldson hasn’t had a sub-5.0 WAR season since he became a full-time big-leaguer in 2013. He earned MVP votes all five of those seasons and won the award in 2015. 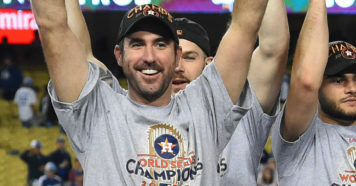 He’s a three-time all-star and a two-time Silver Slugger. He’s second only to Mike Trout among hitters in WAR since 2013—the second best position player in baseball over that period of time. So why the hell should Josh Donaldson be worried? We don’t know what Donaldson’s “ballpark” is, of course, but we have an idea. Spotrac’s new MLB Market Value tool suggests Donaldson will be worth a big-time deal: five years, $136 million. That’s based on his production, age, similar players’ contracts, and more. But after an offseason that saw teams shy away from long-term deals, especially for veterans, should Donaldson be worried? Despite the WAR totals, the home run totals, the MVP votes, there’s one number that’s more important than any other as Donaldson approaches free agency: 32. At 32 years old, Donaldson is seeking to become the oldest third baseman in MLB history to sign a $100 million deal. Since 2011, 34 position players have signed a $100 million contract—only five of them have been as old as Donaldson. Only eight have been older than 30. And for those position players who signed a $100 million contract when they were older than 30, one thing stands out: it hasn’t gone well. The average WAR per season over the life of these deals has been rough. This chart doesn’t include 2018, so active players could still improve that number. But, prediction: aside from maybe Cespedes, who has spent time on the DL this season already, they won’t. When you sign a player for $100 million, you’re hoping for an all-star. You expect them to at least be a “good player” based on track record alone. But only one of these players has been anything above FanGraphs’ definition of a “good player.” And sorry to be the bearer of bad news, but he might have had some help. Donaldson won’t be the only third baseman to get paid big bucks next offseason. Manny Machado (who also plays shortstop) will be an even hotter commodity. And that’s pretty interesting, when you think about it. Machado became a full-time big-leaguer the same year as Donaldson: 2013. And we already told you only Trout has been better than Donaldson over those seasons. Donaldson’s WAR is nearly 10 wins higher than Machado’s since ’13. Machado had a sub-3 WAR during two of those seasons. So why will he demand more money and more years on his deal than Donaldson? Because he’ll only be 26. Obviously. You get it, age is important. Here’s why it’s really important. Remember the $100 million position players 31 and older? If you don’t, scroll up like half a page. Now, look at the position players since 2011 who have signed for $100 million at age 26 or younger. Four of these players have consistently had all-star-caliber seasons. Troy Tulowitzki has been excellent, but hampered by injury since being traded to Toronto. Cubs fans will tell you Jason Heyward helped them win a World Series. And can you believe Elvis Andrus is still only 29 years old? Just think of it as risk management. 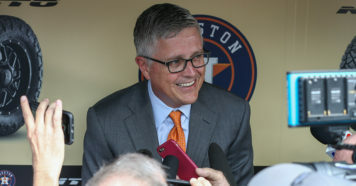 Signing a position player who’s 31 or older to a $100 million deal has gone wrong far more often than signing a player 26 or younger has. And don’t forget: These are hall-of-famers we’re talking about. Some of the best hitters in the history of the world who were, at times, tough to even keep in the lineup once they signed their deal. Just look at the oldest active players in MLB. There are only three position players on the list, and one of them retired mid-season. The second has had a WAR under 1.0 every season since 2014. The third has already been on the DL twice this season. The aging curve isn’t exact, but it is unflinching. 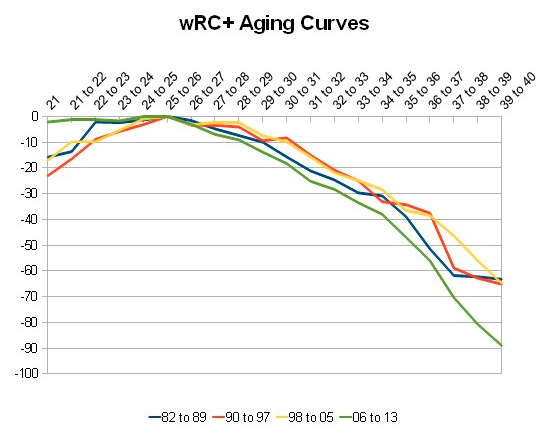 This aging curve shows the downward trend of weighted runs created plus (wRC+) for hitters as they age. Hitters start their decline after a peak in their mid-20s and begin to fall off more rapidly in their mid-30s. Players usually don’t have quite as steady a decline as the aging curve suggests; the fact that it’s an average of hundreds of players makes it a curve and not erratic. But the curve suggests a player’s wRC+ will drop about five points per year from ages 32-36, which would be Donaldson’s age over the life of a five-year deal. From 2016 to 2017, Donaldson’s wRC+ dropped from 155 to 149. This year it’s only 101. But he has missed time due to injury. But we’ve already told you that time on the DL is a symptom of aging. And yes, we know that you already knew that. But if there’s anything redeeming about the aging curve for Donaldson, it’s this: He has been really, really good. So if his wRC+ declines five points per year for the next five years, he’ll finish out his contract somewhere between 115 and 120 wRC+. That’s a number similar to what Christian Yelich and Carlos Santana put up in 2017. 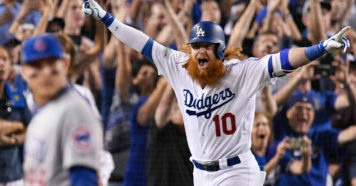 But at age 32, with the track record of aging players and the increased awareness teams have of this information, Spotrac’s $136-million valuation may be hard for Donaldson to reach. Nobody has more confidence in Josh Donaldson than Josh Donaldson. And any team who signs him will be lucky to have him. But when he says his “care factor” about his pending free agency is “zero” on Baseball Stories, Jayson Stark asks him a fantastic question.